You file your taxes and send off a small check for what you owe. Or maybe you expect to get a little back, but not much. Then you’re surprised when you open your mailbox and find a big, fat check from the IRS waiting for you. It includes a letter saying that your return has been adjusted because you forgot to claim such-and-such credit or you actually qualified for such-and-such special program this year. But something seems wrong. You’re happy to have the money, but you feel like something just doesn’t add up. First, it’s important for you to know that the IRS is not some omniscient entity. The agency is made up of thousands of individuals. Yes, actual people who are actually capable of making mistakes and who quite frequently do. Your return isn’t just fed through a machine and spit back out with red lights or green lights. People are responsible for inputting the information into computers and for reviewing it for accuracy. Just because you get a letter saying that you are actually owed more money because you qualified for some credit or some other error was made on your return does not mean that’s correct. The person who made that decision may have misinterpreted the tax code or the information you provided. Why Not Just Keep the Money? If the IRS thinks you are owed the money, what’s the problem? Who is going to tell the IRS that they’ve made a mistake? Well, the IRS can come to that realization on its own. There are many layers of review, and another tax professional in Chandler, AZ may discover the error and send you another, more unwelcome, letter in a few months or even a few years. You could end up owing not only the amount you weren’t supposed to get back, but also interest on that amount and penalties. Yes, penalties. Even if you didn’t know that something was wrong, you were still holding onto money that you weren’t entitled to have, and you can be held accountable for that. Ignorance of the law is no defense of the law. Plus, you have no way to prove that you truly didn’t know about the error. So What Do You Do if You Think There’s an Error? Don’t contact the IRS if you think there’s an error. Getting through to an actual person can be difficult, and it can be quite a mess trying to sort through the layers of bureaucracy that have been put in place. Instead, call a Chandler tax professional for help. In particular, you should consult with a tax law attorney and not a certified public accountant to go over the return. A tax lawyer has more extensive understanding of the tax code. Therefore, a tax lawyer working for you in Chandler can go over your return in detail to understand how the IRS may have made the mistake and how to properly correct it. In some cases, a tax audit lawyer can find other mistakes on your return that the IRS didn’t, whether you filed the return yourself or hired a CPA to do it for you. Therefore, if the tax lawyer discovers that the IRS did make a mistake in returning money to you, the lawyer may be able to find other deductions or credits to get you back more money and make up the difference. Never assume that an extra refund from the IRS is unexpected good fortune. Always call a Chandler tax law attorney to review the return and make sure that you are in the clear. You’ll save yourself a whole lot of headache later. Silver Law PLC in Arizona can help. Our tax audit lawyers all have experience working as IRS attorneys, so they have unique understanding of how these mistakes can be made and what to do about them. A tax audit lawyer from our team can carefully review your return and help you get the information corrected so you have minimum liability. Our team also helps individuals and businesses who are being audited, who are dealing with foreign tax reporting, who are facing criminal tax charges, and more. 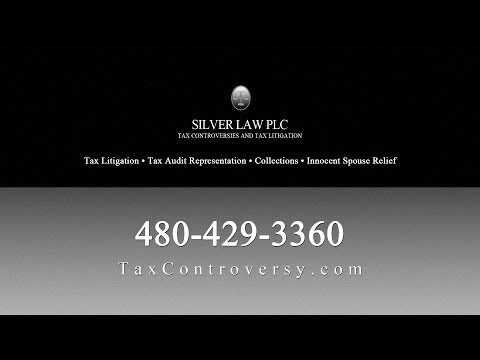 Call us in Arizona today to learn more or to talk with a tax lawyer about your issues.